Frankly speaking, I don't think the rapid decline in China's economic growth that started in the second half of 2018, will easily stop or even slow, although there have been an increasing number of indicators that are confirming an economic slowdown. The harsh deleveraging is believed to be one of the main reasons behind the cooling economy. It is of course, totally justified for the government officials to be worried about high leverage. The debt-to-asset ratio of state-owned enterprises (SOEs) is hovering around 60 percent, but the real problem with SOEs' high leverage is that there are too many zombie enterprises that live on borrowed money but make no contribution to the overall economic development. Local governments' leverage is another source of concern. Since 2014, the central government has allowed local governments to sell bonds by themselves, and has introduced a debt-swap program, which shifted about 11 trillion yuan ($1.63 trillion) of local government debt into bonds trading on the public markets. Yet, local governments' debt has increased significantly again since 2016, and no one knows how high the new local government debt levels are. While it is certainly necessary to deleverage at SOEs, zombie enterprises and local governments, the leverage of the private sector is actually not very high. Moreover, high leverage for some companies, at a certain stage of their corporate development, may be just a normal need for that stage in their growth. As long as the capital chain is not broken, there is no need to be too concerned about high leverage. And it is not appropriate to simply compare China's leverage ratio with that of the US, because our financial system is dominated by banks (which are mostly state-owned), instead of the market-based financing seen in the US. To solve the high leverage problem, we must first pull off the two areas of remedial action: SOE reform and local government financing. To date, little progress has been achieved in these two areas. Of course, it is very difficult to push forward with such reforms, when there are so many vested interests. By comparison, it is much easier to implement macro-control policies like deleveraging. But macro-control policies cannot replace reform and by no means should be rushed. Unfortunately, China's deleveraging measures and efforts seem to be too simplistic and heavy-handed. In particular, the country's tightened asset management rules have blocked various financing channels. 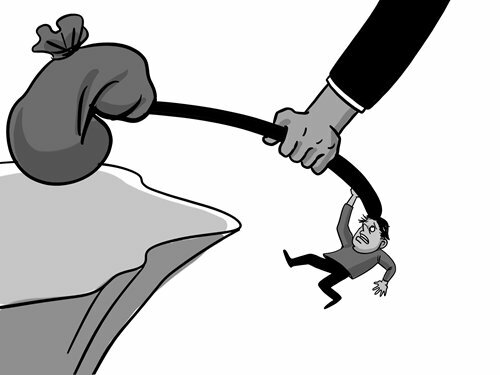 Even though the central bank has injected massive liquidity into the market, private enterprises as well as small- and micro-enterprises are unable to tap the financing pool. While the central bank has tried to support the real economy by lowering the reserve requirement ratios and expanding its balance sheet, the money still cannot reach the real economy due to these blocked financing channels. The US-China trade war may be a reason for the slide in the mainland stock market, but the heavily controlled financing system must also have something to do with it, as this has led to the shortage of money to propel the real economy. First, fiscal support is needed. Local governments should issue special bonds in advance and the Ministry of Finance should make the transfer payments to local governments earlier. Once local governments have some liquidity, they can then restart the projects that have been previously suspended and pay back some of their debts to enterprises, thus pumping money back into the real economy. It is true that there are a lot of problems with local government financing and reform is needed in this regard, but it is more pressing to take measures to tackle emerging issues. Under this circumstance, local governments should be allowed to spend as required, so as to help inject liquidity into the economy. Second, the central bank needs to seriously consider buying quality stocks or bonds of companies facing liquidity crunch or even liquidation. The regulatory controls and the new asset management rules have curbed their financing channel, so the central bank cannot inject liquidity into the real economy by conventional means. Then it would be advised to directly inject money into the real economy. If we believe that the fundamentals of the Chinese economy are strong, the central bank may even end up making money by doing so. But the above two are just emergency measures. The fundamental solution is to seriously reflect on the new asset management rules. Do we really need to completely kill the shadow banking sector? Is financial innovation really so dangerous? The central bank, the China Banking and Insurance Regulatory Commission, the China Securities Regulatory Commission and other relevant departments are advised to work together to review the new asset management rules and other policies that are currently aimed at restricting financial innovation and curbing financing. Maybe there are still some policy tools that can be improved.